Detoxing connotes a regimen for those with substance addictions, but detoxifying is a regimen recommended by nutritionists worldwide and for good reason. As one herbalist put it, detoxification is the process whereby everything from metabolic by-products, preservatives and additives, alcohol and other recreational drugs, free radicals, medications and environmental poisons and pollution are neutralized and excreted. The body is in a continuous state of detoxing, however, purposeful and periodic detoxing, especially after the especially indulgent holidays, is a fantastic way to kick-start the new year, stave off threats to your immune system, and recondition your body. In addition to fighting your way through flu season and all the nasty bugs and viruses that come with it, your body is under the additional stressors that can come with trying to catch up on backlogged work, holiday travel or hosting out-of-town guests, and eating too many rich foods coupled with a drop in physical activity. To get control of the reins again, the following are a few recommendations for naturally detoxifying your body. One general rule of thumb is that the more muscles you get to work (upper- and lower-body muscles and torso), the greater the results. Classes focusing on cardio workouts (biking, spin classes, and boxercise) are excellent for releasing tension. While yoga is often touted as an optimal way to relax, for some the pace can be distracting. If this sounds like you, physical fitness experts recommend something more fast-paced which can shift your focus from your concerns to your body – thus enabling you to reach a more relaxed state more readily. One exception to this is Bikram Yoga, which is known for its intensity. Because of the heat (almost 38 degrees Celsius) and the amount of water ingested during a session, participants are believed to accelerate the elimination of toxins through increased sweating. Sounds strange, but brushing the skin (with loofahs, for example) is an excellent way to aid the body in eliminating toxins. Skin, the largest organ of the body, is in a continual purge – and as we age, the skin’s ability to eliminate toxins (i.e., shed its outer layers) slows down. 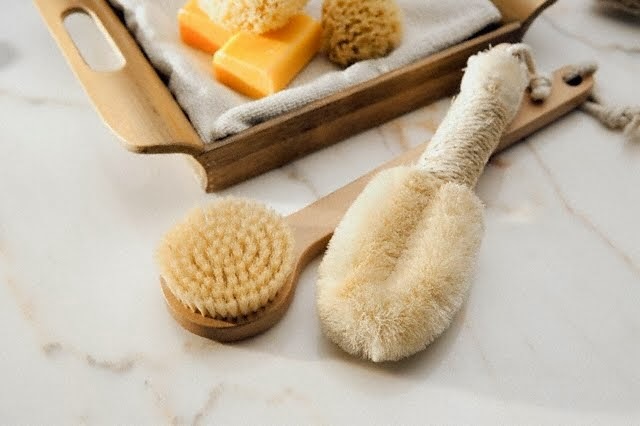 Scrubbing or brushing the body regularly stimulates the skin and lymph system, by pumping oxygenating blood to both, and thereby is a powerful way to aid detoxification. Free radicals ride roughshod over our systems, continuously damaging cells, and have been linked to serious illnesses such as cancer and heart disease. 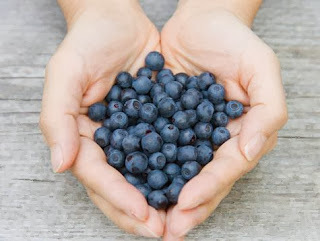 Green tea, blueberries, goji berries and other superfoods are rich in antioxidants. The molecules in antioxidants are great for detoxifying your system. Avoid celebrity or otherwise short-term diets. Drinking dandelion tea is a boon for liver cleansing. Reintroduce friendly bacteria into your digestive system (i.e., probiotics and fermented foods). Eat unheated vegetable and plant food. By taking up these body-friendly habits, you boost the body‘s ability to get rid of toxins naturally. This is a personal blog post, not about my detox foot pads. We have been living in Panama now for just shy of 4 months. We arrived here pretty smoothly. We had a long drive from Salt Lake City to Houston. Then we flew direct from Houston to Panama City. The second night of our journey, we arrived in our hotel just south of Dallas (In Corsicana, TX) and we checked in to our hotel, The Days Inn. We put the dog and cat in the hotel room and shut the door. It was around 8pm and we were hungry and tired. We drove across the highway to get some dinner (a busy highway). When we came back to the hotel room, the door was open and both dog and cat were gone. It has one of those door handles that is a lever, so my dog decided to try to open it, and he succeeded. My whole life is my pets. I love them so much. Aegis is my 100 lb boxer boy, and Bimp is my 13 lb long haired tortoise shell cat. Aegis was dressed up as my little sheep for Halloween, he wasn't too pleased. Aegis just hanging with my husband. 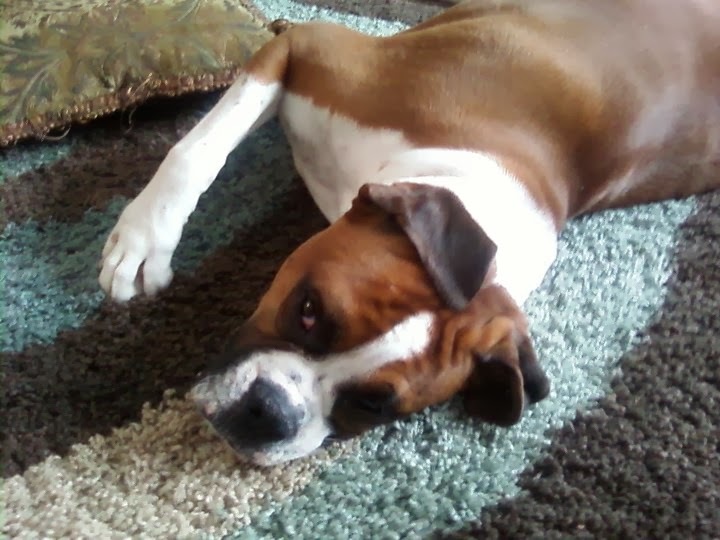 And our sweet Angel who passed away about 6 months after this picture. I prayed so hard, and cried a lot of tears. We frantically searched the surrounding area. My niece found Aegis and he was fine. I cried tears of relief and got him back into the hotel room. As we got into the hotel room, my cat darted in from the parking lot. PHEW! They were both safe. My prayers were answered. I guess the animals wanted to have their own little adventure. We got them onto the plane in Houston that Monday morning, and we arrived in Panama 4 hours later. About an hour and a half drive to our new home, and we were there! 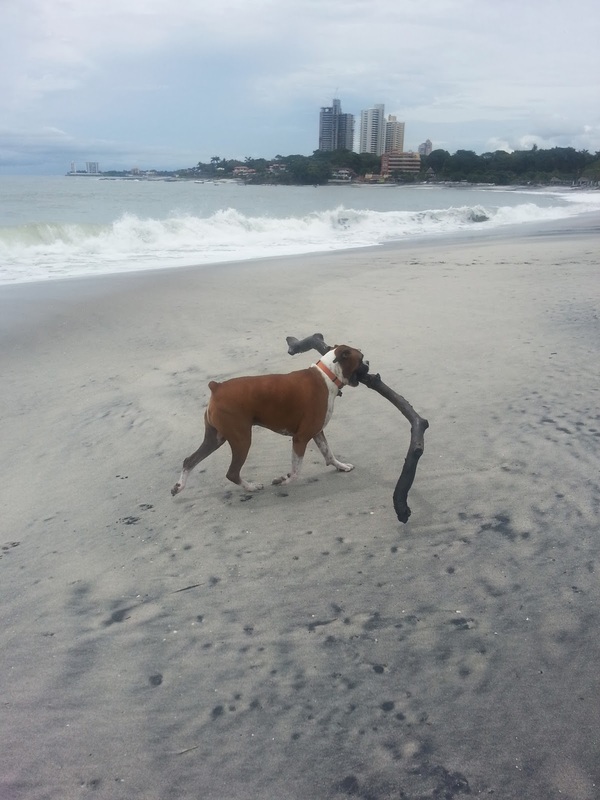 We live a couple blocks from Gorgona Beach in Panama. Aegis LOVES the beach and loves frolicking and running and splashing in the waves. My sister back home is filling all my Purify Your Body orders and she is doing a fabulous job. I am still answering the phones from here in Panama, and emailing back and forth when my customers have questions. I am here. For the time being. We don't know how long we will stay here in Panama, but we have no plans as of now for anything different. My cat is now an indoor only cat, as there are so many wild street dogs and other animals that birds of prey in this area. I don't want to take any chances. We don't even let my dog out without us keeping watch. Worrywarts we are! Everyone is safe and sound. Ever battle a nasty sinus infection that didn’t want to go away? Do you get recurring sinus infections and just can’t seem to put an end to the constant pressure and pain? If you do, you’ve probably been to the doctor and they’ve prescribed powerful antibiotics. You pop a few of those pills every day and the pressure slowly goes away over a few weeks. But then you run out of antibiotics. No big deal, because the infection is gone right? Wrong. Your experience has likely been that after it takes the edge off of the pain, you don’t seem to get any better because after you quit taking the antibiotics, you get another flare up and the raging infection comes right back, sometimes much worse than the first. The antibiotics wipe out 80% of your immune system so once the antibiotics are gone out of your body, you’re left with virtually little defenses. That means you’re easy prey for any old airborne bacteria (not very optimistic because we humans breathe in bacteria all day long). The antibiotics don’t get to the surface of your sinuses so in actuality, they don’t kill all of the infection. So once you stop taking antibiotics, there are still infectious cells on the surface of your sinus cavities that then swarm and grow quickly, bouncing back with a vengeance. If you experience a raging sinus infection, you may need to do this protocol a few times before extreme the infection will subside. Most common sinus infections are healed after just one treatment. Make sure you have a full 15 minutes for this protocol. Lay on your back, preferably on a comfortable bed, with your head hanging out over the edge of the bed. Try as best you can to have your nostrils perpendicular to the ceiling by tilting your head back as far as it will go. Have someone else place 5 drops of NutraSilver straight down each nostril (It’s hard to do this yourself, but it can be done). This will feel weird and tingly, that’s to be expected. It may make your eyes water, but it shouldn’t be very painful unless you have a massive infection, in which case it will burn. Very slowly, vacillate your neck back and forth (and side to side) to coax the NutraSilver to get all the way to the back of your sinuses. Do this about 5-10 times. Hold your head tilted back in this position for an entire 15 minutes so that the NutraSilver has time to flow to the back of your sinuses and kill the entire infection. To enhance the effectiveness, place 30 – 50 drops of NutraSilver in non-tap water and drink three times a day until all symptoms are gone. Follow this simple protocol and you’ll see great benefit. The majority of our customers report that they see relief almost immediately depending on how prolific the infection is. For most sinus colds and flus, this protocol is extremely effective and results are near immediate. Super Healthy (and Kid Approved) Gummy Snacks with Elderberries and Kombucha! Tired of all the “extras” in children’s gummy snacks? Color dyes, sugars, etc… are all too common ingredients found in gummy snacks. Maybe you want a great tasting way to get more nutrient dense real gelatin into your diet. I have adapted a few recipes I have found to make these snacks that are a powerhouse of nutrition including loads of vitamin C, probiotics, raw honey, and beneficial real gelatin. Add ingredients into a small sauce pan, combine them with a whisk until no lumps are visible and mixture seems even. Turn stove to the lowest setting and keep whisking until mixture is completely melted and warm to the touch. Do not let mixture get too hot to conserve all the properties in the raw honey and other ingredients. Transfer to a pan or candy mold (here is where the decorator tool comes in really handy, but you have to work fast as it will solidify after a while). Pop in the freezer for about 10 minutes. Gummies will remain solid even at room temperature. I keep mine in the refrigerator to maintain the best texture. No need to grease the molds or glass pan. My family loves them! - Source of protein (though not a spectacular one) but its specific amino acids can help build muscle. Boost your immune system with these snacks and wear your foot pads at night and that’s a recipe for success!